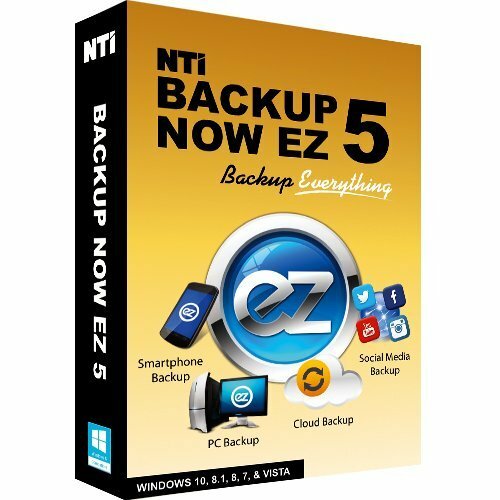 Home › Electronics › Nti Backup Now Ez 5. The Best Backup Software That "Backup Everything". Popul..
Nti Backup Now Ez 5. The Best Backup Software That "Backup Everything". Popul..
NTI Backup Now EZ 5. The Best Backup Software that "Backup Everything". Popular and Easy-to-use. Social Media Backup. Email Backup. Cloud Backup. Image Backup. Mobile Backup. File Backup. Easy restore from multiple restore points; Restore specific files from image backup, and many more features! Whether you’re a novice computer user or an IT pro, Backup Now EZ 5 is theright choice for anyone looking for a simple yet powerful backup solution.Social Media Backup: Will back up your social media accounts (Facebook,Instagram, Twitter & YouTube) -your most important online postings, pictures &videos are backed up, safe and secured on your own computer.Cloud Backup: Willback up to off-site cloud storage accounts (NTI Cloud, Dropbox, Google Drive &OneDrive), give 24/7 access to your data from anywhere with Internet access,with free apps for access from mobile device.File & Folder Backup: Mostcommonly used files are grouped into 3 categories: Multi-Media, Documents, andEmail & Favorites, select the categories you want and it will search theentire PC and back up only those file types. Custom Select tab gives you astandard file and folder tree view to choose specific files and folders.PCBackup: Will back up your entire PC (OS, programs, files & settings, etc.,requires the PC supports booting from an external USB drive) and when needed,will quickly restore your PC back to last known good configuration. Just bootup from either a USB flash or USB hard drive and it will automatically loadyour backup set with the latest restore point. The restore process willautomatically prepare your replacement drive by partitioning, formatting, andthen restore all of your PC’s data. Everything is automatically done in oneeasy step. A new feature Single-File Restore allows you to restore specificfiles and folders from a Backup Image without having to do a full imagerestore.Mobile Backup: Back up photos and videos from your mobile phones(Android or iOS) to your PC storage via Wi-Fi connection.